Play in The Gallerist goes down a few of the traditional Eurogame roads of worker placement and set collection, but the game has strong thematic ties in how you, as the operator of an art gallery, can both speculate on and influence the value of up-and-coming art. The production value is high as well, from the large tokens, to the tiny wooden easels, right down to the box itself, made to look like an unwrapped canvas. 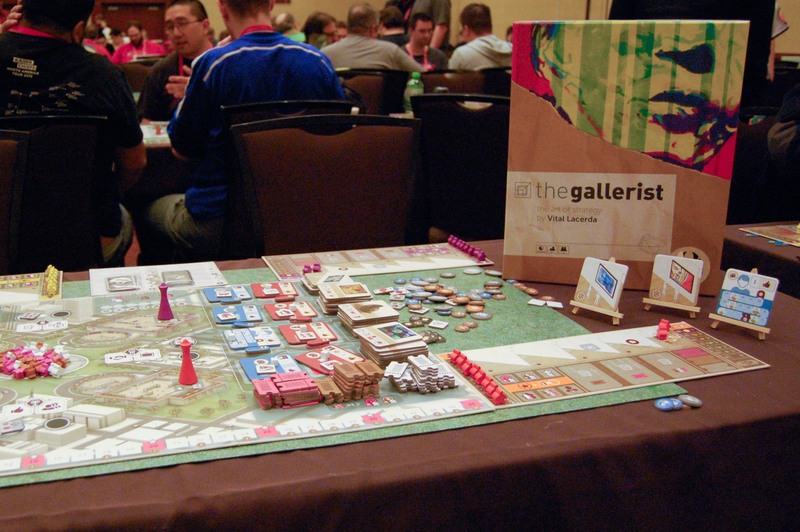 BGG.CON was the perfect storm of success for the The Gallerist. Designer Vital Lacerda (Vinhos, Kanban, CO2) has established quite a name for himself among BGG.CON's core demographic: fans of heavy Eurogames. The Gallerist also just happened to land in Kickstarter Backers' mailboxes earlier this month, making it an easy choice when settling in for a more complex game that you might not usually have the time or proper group to play outside of the con. There is a lot going on in The Gallerist, and there was a lot of The Gallerist going on. The Gallerist is available now, in most game stores and online.